While you can always enter data directly into database tables, you might find it easier to use forms. Using a form to enter data lets you be certain that you're entering the right data in the right location and format. This can help keep your database accurate and consistent. This lesson will address the benefits of using forms in a database. You will review examples of different forms and form components. 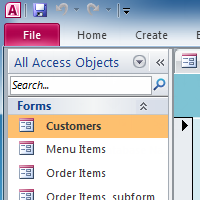 Finally, you will learn how to use forms to enter new records and view and edit existing ones.